Software for post-processing of 2D - DXF graphics and drawings (DXF format 12 or lower) which are intended for CNC machining. 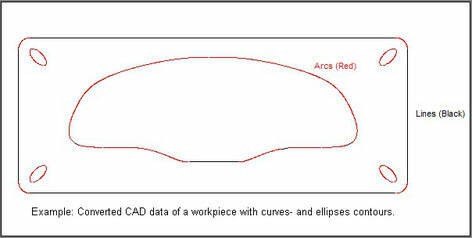 For the use of CAD- and graphics data for CNC machining curve elements such as ellipses, bezier-curves and splines are often decomposed into polylines or into very small line segments. The software „DXF R12 CNC Polyline Reducer“ allows the transformation of such small line segments into circular arcs and longer lines for an improved CNC - machining. Reduction of the number of lines. Convert small lines or polylines into arcs. Smoothing of generated curve contours. Avoiding jerky movements during CNC machining, which can occur by too many small line segments. For the conversion of splines from CAD- or graphic- programs with DXF R12 CNC Polyline Reducer you must save these curves in the DXF Format Version 12 or lower. In this format the curves are automatically converted into polylines. Splines are implemented differently by CAD- or graphic- programs. When loading DXF splines, which are created with other programs, very big deviations in the curve-trajectory are possible. These very strong deviations are avoided when the splines are stored as polylines (DXF format R12). Additionally you get a download link to download a full version which is generated for you (on business days within 24-hours). When ordering, please enter the code number, which is automatically created by the demo version for your computer.